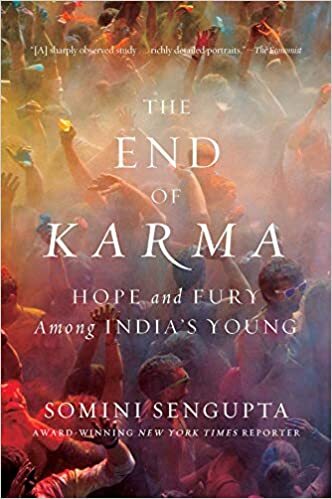 The End of Karma is an extraordinary look at India, written by someone who has known India from both inside and outside its borders. Somini Sengupta reports for the New York Times. Born in India, she grew up in California but returned yearly with her parents to visit family. As an adult she became the NY Times bureau chief for New Delhi, living there for several years. She is a daughter of India, the mother to a daughter of India, and yet also brings an American perspective to her stories. She is, in her words, N.R.I.–Non Resident Indian. This is a term used by Indians themselves for the vast diaspora from their country, people who now make their homes in lands far away and yet find the pull of this ancient culture still tugging at their hearts. Sengupta tells the stories of several young Indians raised during a time when India stepped out onto the world stage unlike any previous time. In many ways, the last (roughly) three decades have been a time of incredible advancement in the country. Poverty is down. The economy has boomed. Construction has exploded. Life expectancies have nearly doubled. Education is widespread. Childhood vaccination has become widespread, and disease is commensurately lower. Hunger is much rarer. India soon will be the most populous country on earth, and with this enormous population and dynamic economy has come new stature in international politics. The stories of young adults coming of age during this time tell of the hopes and aspirations of this generation. They are better educated, richer, and have higher expectations from life than their parents. But the old India has not fully released its grip on their lives. Marriages are still largely arranged. Female feticide, though illegal, is not uncommon, leading to a huge disparity in the male/female ratio. Girls are on average less educated than boys and have fewer prospects. Infant mortality is down, poverty and hunger are reduced, vaccinations are up, but India still has more people living on less than $2/day than any other country in the world. The caste system has been legally abolished, but it still plays a significant role in daily life. Indians can see a day coming when the caste system is a memory, when arranged marriages are historical oddities, but that day is not here yet and there are many who do not want to see that day arrive. The women in Sengupta’s stories fascinate me. One of them, Mani, aspired to escape her impoverished rural village. She set herself a goal to move up in the world, and she achieved that goal. What is hard for this western reader to appreciate is that her “moving up” was not a rags to riches story–it’s a rags to better rags story. She worked for years as a nanny/housekeeper for a middle class family, cleaning their apartment, doing their laundry, cooking their meals, watching their children. This family was more inclusive than most–they did not always insist that she eat separately, use her own dishes, never sit on their furniture, and otherwise maintain the physical separation between themselves and their unclean lower-caste servant. They even gave Mani a day off each week so she could attend church. Mani made enough money to send home and give her siblings a chance at better lives, enough money to help her mother build a better house, enough money to make a real difference in the lives of her family. And the family she worked for helped her in other ways: when Mani’s cousin was kidnapped and sent into forced labor as a housekeeper in another city, Mani’s employer actually helped find her and paid some of the bribes to free her. Mani’s situation is not a story where she was manipulated by an evil employer. On the contrary, she was extraordinarily fortunate to be hired by the people she worked for. But the entire situation spoke to me about both the similarities and the differences between us. Mani had a dream and she pursued it. Her dream came true! She found employment in the city, away from the desperate situation at home. She made enough money to change the future for her entire family. She was even able to rescue a cousin who had been kidnapped! What could be more American than that? Yet, that dream had her living in a small room of a small apartment, with little or no property of her own, working all day six days a week, in a position with no prospects for advancement and no expectations of that. And Mani knew that she was one of the more fortunate people in her position! Sengupta, though, is careful to show that in many ways India is not so different from America. Few Americans have live-in servants. But many of us hire maids or gardeners whom we do not allow to live with us and we show no concern about their personal living conditions. Many of us hire people to cook and deliver our food, with no thought as to their medical benefits. And how many Americans would personally step in to help the kidnapped niece of our Lyft driver? Americans rely heavily on low-paid workers to take care of a multitude of tasks. We’ve just separated ourselves from their lives. India is a huge country, with a huge population. It has made incredible progress, and there is every reason to believe that progress will continue. But it continues to face huge challenges. Mani’s story, along with the others in the book, powerfully shows how far they have come in such a short time. But the stories also show what challenges remain. Whether those challenges come from an increasingly restive Facebook generation insistent on having their free speech respected, from an impoverished rural region which can now see online how the “other half” lives, from women who will no longer stand for being objects of abuse, or from religious minorities or from long disrespected castes, how the country reacts to those challenges will shape how the next set of stories are told. Somini Sengupta did not set out to write the definitive story of modern India. With over 1 billion people, there are far too many stories to tell than any book could hold. But the stories she tells show us an India in transition, an India finding its way in a changing world, an India that is held in tension between a very modern high-tech society that they are helping to shape and a very ancient culture they are fighting to preserve. The resolutions they find will not only shape their future. The future of India is in many ways the future of the world.